At the Fairies Toadstool - Fairy Tea Parties, we look forward to feedback from our customers and we also look forward to helping our customers and visitors to our site with their enquiries. Alternatively you can email me or submit your enquiry by filling in the form. 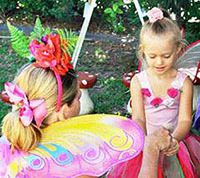 Quality Fairy prizes will be included for the winner of the Party Games. Thankyou for download our information. Please contact us should you have any questions.